Some news that made me stop and think this week was the announcement of the death of Gerard Benson, one of the founders of Poems on the Underground. 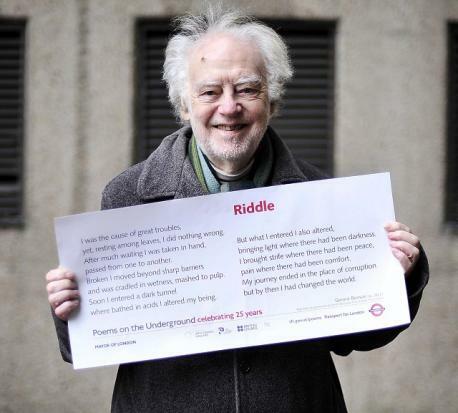 I didn’t know Gerard Benson or his writing but I have benefitted hugely from reading poems posted behind the straphangers on London’s tube trains. The scheme started in 1986 – this was at a time when I had for several years been living in a series of rented, shared flats and single bedsits on the far flung edges of the Underground system. I lived in end-of-the-line places like South Wimbledon, Mile End, Boston Manor, Finsbury Park and Archway (because the rents were cheaper) but I worked in central London (because the wages were better) which meant a long tube journey at either end of my working day. During that era, in my early to mid-twenties, I mostly worked as a temporary secretary for a variety of different businesses: insurance agents, commodity brokers, market research companies, management consultancies, blah, blah, blah. These were jobs that I took, not because I was interested in what the company did but because I needed to earn money to pay my bills. I’d left school with few academic qualifications and spent a few years doing low-skilled jobs such as working as a door-to-door salesperson for a carpet, curtain and upholstery-cleaning company (a job I loved in many ways, not least because I worked outdoors so wasn’t stuck in an office, but not a post with any prospects) and two years working as a children’s nanny in France (this job also had its highlights). When I came back to London in my early twenties, I trained as a secretary – I did a government-sponsored TOPS course (Training Opportunity Schemes – remember those?) and found a lot of work as a temp, eventually settling with a full-time job and saving enough money to buy a small flat before, at the age of 30, giving everything up to go to University to study English and Creative Writing. I can’t actually remember any of the poems I read on the tube at that time but I can remember that they made me feel happier, more hopeful, changed, more alive during those dreary, stuffy, boring journeys. They took my mind to another place while my body was being transported through miles of underground tunnels. The poems gave me something but asked for nothing in return other than to read them – or not read them. There was no eye-catching image to make me turn my head and no promise of how my life would improve if I made it to the last line. Radically different, then, to the advertisements that line the walls of tube trains and stations which although sometimes beautiful, interesting, amusing and entertaining, ultimately, want something of me (usually money) and imply that my present state isn’t complete because it’s lacking the service or product being advertised. This is the joy and the generosity of public art – in this case poetry – and wouldn’t it be wonderful if there was more of it? I like the sound of Poems in the Waiting Room and I think that in some places there are poems on the sides of buses. Poetry trails are another good idea. I wonder what happens where you live or what you might have done yourself to engage with poetry or to make it happen in public spaces? P.S. Anthony Wilson has written a beautiful tribute to Gerard Benson (pictured below) here. I don’t think it’s just cool and awesome, it’s positively essential. Too much poetry is written by poets almost exclusively for poets. So many people are afraid of poetry, or think it’s purely boring and it helps if they have a little encounter with it now and again in a public space. Clarissa has blogged about public poetry she’s encountered here: Walking Amongst Poets and Poems in Bulgaria and you might also enjoy “Go, Little Book”. Poets in Edinburgh. One of my favourite public poems is Andrew Motion’s “What If…?” on a Sheffield Hallam building. Close to home, as part of Everybody’s Reading festival in October 2010 (and, I think, 2011), Wee Poems by local poets were posted on toilet walls and cubicle doors in Leicester city council buildings. Thanks, Jayne. Jo Bell has posted a picture of Andrew Motion’s poem on my Facebook page. Toilet walls and cubicle doors – brilliant ideas! I have heard lots about this event, Kerridwen, and it’s fabulous to know that you were part of it! I enjoyed reading this. It’s so familiar and I’m only a bus ride from South Wimbledon tube! I was interested to see you had few qualifications when you left school – I had none and found my way back into education through short courses with the OU. I did a couple of courses incorporating writing which helped me so much. Someone gave me a copy of Poems in the Waiting Room which I thought such a good idea. The more out there the better. Great post. Thanks. The beauty of public poetry is that it is available for EVERYONE, not just for “educated” people or, indeed, as Clarissa has commented, only for other poets. Wonderful to hear that you’ve found your way back into education, Heather and what a disgrace that mature students in the UK can no longer apply for an educational grant to help them complete a degree course. Libraries, another rich resource for learning, are also under threat. Thanks for commenting and good luck with your continued journey of self-education! I too remember long tube journeys completely changed by a poem up on the wall. They were magical. I used to wonder why many people stared at the floor when they could have been reading them. I hope Gerard Benson knew how much he gave to people. As always, thanks for the comment, Isabel. Another generous blog post, Josephine! I always look out for the poems when I’m travelling by tube – they are welcome oases in all the bustle and hurry. In the 1990s I had a number of poems displayed on London buses through projects organised by Alex Mermikides. I’ve written better poems since (I think, I hope! ), but it felt great to have that exposure, and a privilege to be included. Thanks for you very kind comment, Hilaire :-). I love your description of the poems as oases – so true! and incredibly impressed that your work has been displayed on London buses – wow! P.S. meant to ask what date in November you’re reading at The Bear? Would love to come along. It’s November 20th. Will be so good to meet you at last! I’ll post a reminder nearer the time.